How could you not love going here? It is a unique and wonderful experience. Every patron is treated with special attention. This is no cookie cutter hair salon here! Christopher is an artist, so, if you do not respect art and do not want to spend the money, then I recommend going to SuperCuts. Although on the pricey side, you get what you pay for and I have never been disappointed. Suge summed it up nicely...Christopher Pluck is a genius with hair! He's great - a real pro and really engaging person too. You will leave with the best style, looking and feeling your best. He is not cheap, but the best things rarely are, right? I know its a bit unusual for a man to go to a salon to get a haircut. I've been going to Christopher for 27 years when I wanted to try something different than the traditional barber bowl cut. He is a true artist and professional. He gets to know you and what you are looking to do with your style during whatever period of life or time of year. I have many friends and family that now go to him, because I always get asked who styles my hair. I've been offered free haircuts from other places but won't let anyone else touch my hair. 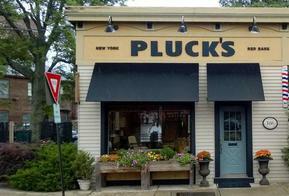 I have been going to Christopher Pluck's for almost a year. It is the first time anyone has cut my hair just right. Amber does an absolutely wonderful job with giving me the perfect cut. Everyone is friendly, I cannot recommend them enough. I have been going to Christopher Pluck for almost 2 years now and every time I go I am just as impressed as I was the first day I went. Kristen is the best colorist and Christopher is the most amazing stylist! All my friends ask me where I go and these two are the only people I trust with my hair! We are GRATEFUL ....thanks everyone!! Christopher and Amber-- I just wanted to tell you that I am receiving an astounding amount of unsolicited comments on the streets from people (particularly the Millennial set) about my undercut with purple highlights -- "You are amazing", "absolutely awesome", etc. You transformed me from unremarkable middle-age to silver-haired fox in a single session. Feeling Fab --Thanks! It's been over 4 weeks sińce my first visit to your salon, Christopher, and I hope that there will be many, many more. I loved my new haircut when I was leaving salon, and love it more every single day since! "Conservative or daring?" was your question and I'm glad I listened to advise of your assistants as well as clients; we decided on daring. I plan to make second appointment very soon. I just wanted to send a note and tell you how much I LOVE my haircut. I apologize for not being able to verbalize exactly what I wanted, but between the two of you - you nailed it! Thank you and Have a wonderful Christmas. Awesome cut! Thanks! Great to be back and see Christopher and the team.